There is a deep physical unease that is experienced at the site of tragedy: a lingering presence of something inexplicable. “Haunted Reality: Death in the Walls” invites this unease into your home, and uses the Epson Moverio to tell an interactive story of a disturbing presence within the very walls of your home. 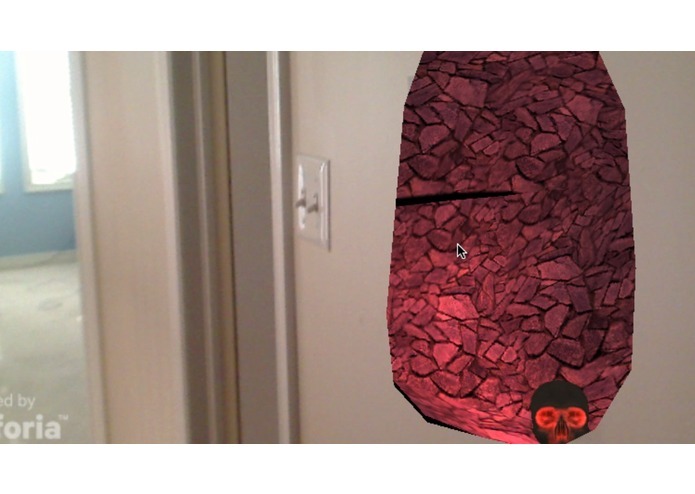 “Death in the Walls” is a proposed game for the Moverio, using Unity and the Vuforia SDK. The game begins with the discovery of human remains interred within a space in the wall of your home. Exploration of the space will reveal clues as to their origin, but also awakens a malevolent presence which must be periodically warded off in order to survive. The purpose of this game is to entertain players, explore how augmented reality (AR) can be used in interactive horror, and showcase the features of the Moverio. The player will place several AR markers on the walls of the play area, which are used to super-impose “holes” in the walls. These holes act as windows into 3D spaces used in the game. The Moverio’s stereo display capabilities provide an illusion of depth, and allow the user to move relative to the “hole”, and reveal new detail. The user interacts with the game by simple gestures: indicating objects to interact with, and tracing patterns to ward off evil spirits. By exploring these 3D spaces, the player will unlock clues, uncover the events and presence in their home.